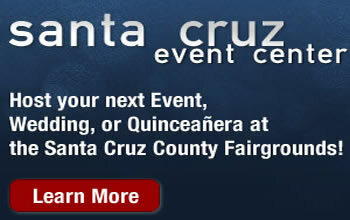 Come to the Santa Cruz County Fair on Saturday September 15th when it opens at 10:00 am. With so many events and attractions, fairgoers can enjoy themselves all day. The Carnival rides start at 10 am for a day of fun for the kids. They will also be delighted seeing the All Alaskan Racing Pigs, the Sea Lion performances, and participating in Circus Imagination. Each has multiple shows during the day. The annual Fair Diaper Derby begins at 11:30 am when babies and toddlers compete in the fastest crawl to the finish line. Look for the funny Fables of the West as they ride around the Fair. A group of witty cowboys with wacky tricks, high energy, and western style, their comedic improv shows have people smiling and laughing all day. As The Fables often say, “We like to ride into a crowd, sing a little ditty, twirl our guns and dazzle the folks with our fancy horse moves.” They bring the fun of the Wild West to everyone at the Fair. Yesterday’s Farm will be busy during the day with spinning demonstrations, cooking lessons, Draft Horses, and Antique Cars. Visit the Art in Action area at 1 pm to see participants compete in the exciting WASCAR (Wheels And Spindles Creative Arts Racing) contest. Katie Ekin will start off the Saturday’s entertainment. The 20 year old singer-songwriter who was born and raised in Santa Cruz has always had her heart in music. She can be seen playing folk-pop on the Amphitheatre Stage at 11 am. The Las Sirenas Belly Dance Fusion will be performing at noon on the Amphitheater Stage. Then see Santa Cruz Belly Dance at 1:00 pm, and Steps Dance Studio follows at 1:30 pm. The KWAV Central Coasts Got Talent competition begins at 2:30 pm. The Junior Livestock Auction gets underway right at 10 am. Down in the horse arena, the Watsonville Saddlites, Inc Gymkhana can be seen at 3:00 pm. The Hunter Jumper Show will begin in the evening at 7:00 pm. Then the Watsonville Saddlites are at it again for their Barrels and Chowhide show at 8:00 pm. Back for the second day at the Fair is Auto Racing in the Grandstands. The Wingless Sprints will be tearing up the track into the evening starting at 4:00 pm. After all this, country artist J. T. Hodges comes to the Amphitheater Stage for the evening entertainment. After growing up in his family’s recording studio in Fort Worth, Texas, he released his first single “Hunt You Down” in 2011. Since then he has gone on to release his self-titled debut album and new single “Sleepy Little Town” in the last month. Hodges will be sure to pick up more fans with his baby blue eyes and country-rock sound when he plays Saturday night at 7:30 pm. The Santa Cruz County Fair will take place now through Sunday. More information and schedules can be found at santacruzcountyfair.com.